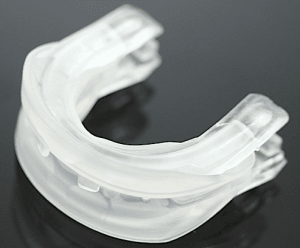 Ripsnore Mouth Guard Review | Does it Live Up to TV Infomercial Hype? Considering Ripsnore is priced right in line with many other good anti snoring devices, I expected it to at least be comfortable or effective, or maybe even both. It claims to have a 98 percent success rate and it is an “As Seen on TV” product, so it’s quite popular. Sadly, as I should already know, winning a popularity contest means nothing in the world of snoring products. 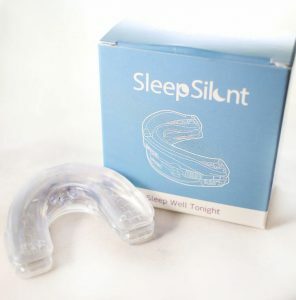 It has some great qualities and it is marketed well, but at the end of the day I had a pretty bad experience with the snoring mouthpiece. Airflow port in front allows for mouth breathing. Device is made of an FDA-cleared plastic that is free of BPA. Boil-and-bite method is used to achieve a custom fit. Ripsnore is moderately priced, and in line with many others. Backed by a 45-day money back guarantee and a 6-month warranty. Material is transparent to make it less noticeable while wearing it. 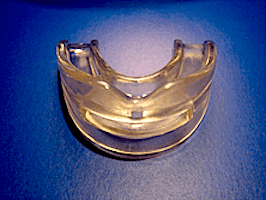 Some denture wearers have been able to wear this device. Although the plastic is FDA-cleared, the device is not. Manufacturer is not accredited by the Better Business Bureau. Bulky design is quite invasive in your mouth. Lower jaw adjustments are not possible. There are complaints about the device being difficult to return. One size fits all is too big for small mouths. Claims of clinical trials on the site have no evidence to back them up. Lifespan can be as short as three months. Overall I found this to be a really sub-par snoring mouthpiece. The fit was really bad, and I didn't find it effective. All I got out of the experience was an angry wife and a sore jaw. Plus I noticed some false claims by the company on the website, so overall not recommended. 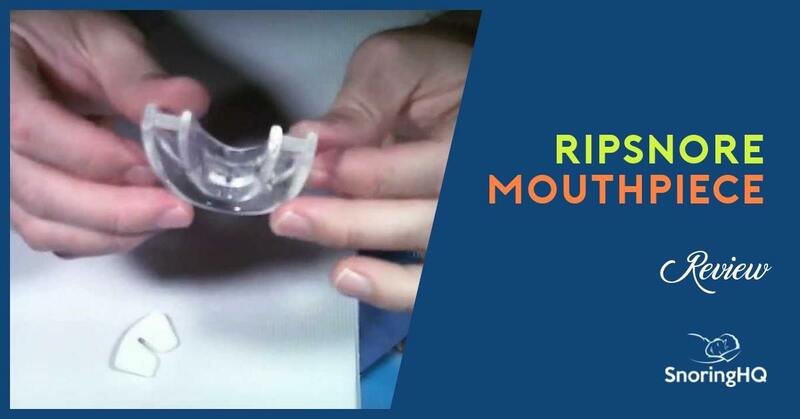 Ripsnore is a mandibular advancement device (MAD) that was designed to make breathing easier and to prevent tissues from vibrating together by keeping the airway clear. Like other MADs, you fit the device at home using the boil-and-bite technique. It also has an airflow post at the front to allow you to breathe through your mouth while you are sleeping. 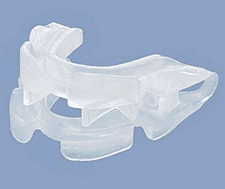 So, if you can’t breathe through your nose due to nasal polyps, sinus issues, or a deviated septum, you will appreciate that this mouthpiece has this feature. This MAD is made of Dynaflex, which is a BPA-free material. The material is cleared by the United States Food and Drug Administration (FDA) and the Conformite Europeene (CE). It’s important to note that although the material is cleared by the FDA the device is not. There is some wording on the Ripsnore site that may lead you to believe the product has been cleared, but it’s not. The company is not accredited with the Better Business Bureau either, even though the website says the product is. While on the topic of false claims, perhaps I should mention that the 98 percent success rate it brags about has no studies to back up these claims. Ripsnore is transparent and non-irritating. The site says the mouthpiece can be resized as many as five times, but it also says that if you need to refit it more than three times to use the second included device so, it is a little confusing as to how many times you can actually refit your device. As for cleaning, Ripsnore’s website says to rinse the device with water after using it. However, a simple rinse can hardly be considered sanitary. I ended up using mild dishwashing detergent, since I know some devices recommend staying away from toothpaste. It would have been nice to know exactly what the manufacturer recommends though. I actually like the simple design of Ripsnore, so I was eager to try it. Some of my favorite devices have the simplest design. They just sort of work for me. When I ordered there was a special going on, so I got two for $67 (one was for my wife). The devices arrived a little slow. As soon as they showed up, I removed them from their boxes, so we could get a feel for them and get them fitted before bed. At the very second we opened them it was as if I could read my wife’s mind and she was thinking these mouthpieces did not look nearly as streamlined as they did in advertisements. They are so bulky! Still, we thought maybe once we fitted them they would be a lot better. We used the boil-and-bite method and it took three times for me to get a good fit. My wife decided she was not even going to participate this time. The device was so large that it made her gag every time she tried to put it on after fitting it. I was on my own for this trial. When I put the mouthpiece in the first night, I drooled a lot. I usually do at first while my mouth adjusts, but this was a little obnoxious. “Weird” is the only word I could use to describe it. It was around 10pm when we went to sleep, and by the time the dog woke me around midnight to go outside to do his business, my Ripsnore had already fallen out. I rinsed it off, put it back in, and went back to bed. When I woke up in the morning, I felt exhausted. It was very obvious that I didn’t get any quality sleep. By the look on my wife’s face, I could tell she didn’t get much sleep either. She said it actually worked a little while I was wearing it. There was still some snoring, but not the symphony I usually create. Then, the mouthpiece fell out and of course, my loud snores reappeared. I wasn’t really sure what to do other than try again. Customer service told me to go ahead and do the boil-and-bite technique one more time to see if it would help, as if my three attempts the day before would suddenly be overdone. The second night, I put the device in and wondered if doing the fitting process made it any better because truthfully it felt worse. My Ripsnore stayed in a little longer on the second night. My wife got up around 1am for a glass of water and said I was still wearing it. Again, I was snoring, but it wasn’t loud. However, at some point it did fall out again before the alarm went off. Not only did I still feel tired; my jaw was aching. My mouth was definitely not appreciating that bulky piece of plastic it was being forced to accommodate. The rest of the seven-day trial had the same results. Sometimes, it would only stay in for a short time while other times it stayed in place for hours, but made my mouth increasingly sore. It never did fully stop the snoring while wearing it. Ripsnore is $67 and includes shipping. This price is for two devices. It would be nice if there was an option to only order one, especially so you can try it to see if it works before investing in two. Ripsnore is backed by a 45-day money back guarantee and a 1 month warranty against defects. The site is secure for ordering and it accepts PayPal. I would have a really hard time recommending Ripsnore after my experience. I understand that not all devices work for every person, but the fit for this device is just off. It is way too large for a person with a smaller mouth, but a little small for others. For me, it never quite lined up right, and it made my jaw really sore. Personal experience aside, even if I would have found Ripsnore to be effective, I still wouldn’t be able to recommend based on the false statements made on the site. Saying that a product is FDA-cleared or that the company is BBB-accredited left a bad taste in my mouth. If you are looking for an affordable MAD that is both comfortable and effective, I recommend reading my ZQuiet reviews or Zyppah reviews. Both of these devices were far more comfortable and effective at limiting my snoring.